I've finally got most of my Christmas cards in the mail. There are always those stragglers because you're hunting down addresses. This year I wanted to include our baby girl some how, but I didn't want to put my belly on blast. Ha! I almost decided not to do Christmas cards this year but Ryan said this would have been our first year not having them. So I had to think of something fun to do. I really like those pictures where the parents are in a line, and then there are booties next/in between them and you only see their legs. Ya know what I'm talking about? But since I was taking the picture that sounded too complicated in my last minute preparation. So I had us run outside so that I could snap the picture below, and then I literally came inside, downloaded it and ordered the cards! So easy. Sorry they are kind of blurry on here but you get the idea. The back two pictures were photos that Ryan approved for the card from some of our trips this past year. The top one was in Puerto Vallarta and the bottom was in Sedona. 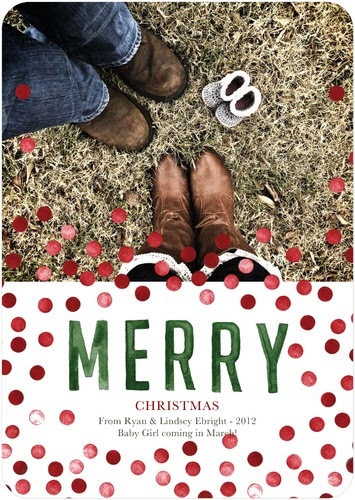 This was the first year I've ordered from Tinyprints, and I was really impressed with them. Plus the cards came so fast! (P.S. I'm not getting compensated to say that.) I like to try out different companies each year. Click here, here and here to see our past Christmas cards. I love this one! It's still unusual but really cute. I decided at the last minute to do cards this year too because I knew I would regret not having it one day. Good job! I love your picture on the front. So cute! This is darling! Congrats to you guys.